In a newly released press release, Namco Bandai announced that Ezio Auditore from Ubisoft’s critically acclaimed fan favorite Assassin’s Creed franchise will be featured as a playable character in the upcoming fifth chapter of the Soul Calibur franchise. Ezio will feature a myriad of special attacks and will wield a variety of signature weapons from the series including a Roman Longsword, a Stiletto, the indomitable Crossbow, a Hidden Gun, and of course the Hidden Blades which are a hallmark of the franchise. The inclusion of Ezio di Auditore from Assassin’s Creed is similar to Soul Calibur’s past useage of platform-specific guest characters, which also act as incentive bonuses to purchase the titles. Recent guest characters include Link, Darth Vader, Yoda, and even Master Chief from the Halo franchise. 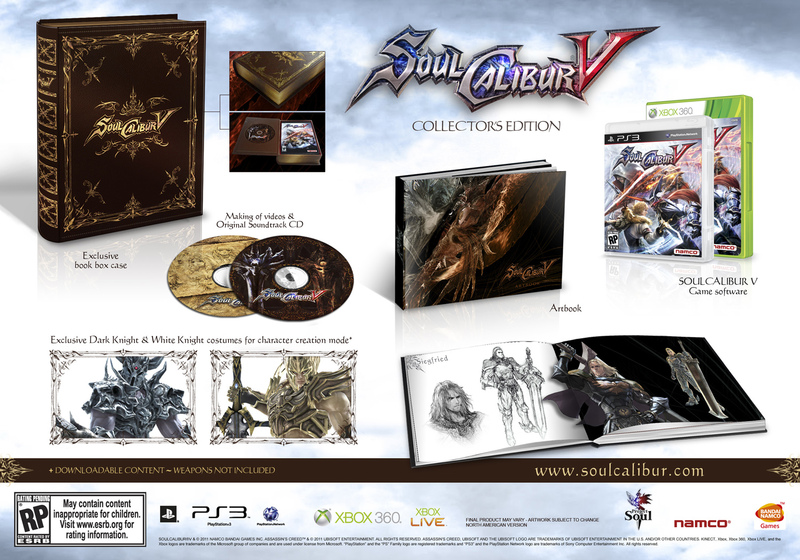 Soul Calibur V’s Collector’s Edition will include a specifically designed book box package, a high quality art book, an original soundtrack CD, a making-of Soul Calibur V DVD, a redeemable DLC card for the Black Knight and Paladin Armor sets, plus original artwork and a parchment letter signed by the team at Project Soul. Additionally, gamers who pre-order Soul Calibur V at select retailers will receive an exclusive bonus: Dampierre from Soul Calibur: Broken Destiny will be included as a playable character on day one. Soul Calibur V offers a distinct and unique 3D fighting experience, and the upcoming release in the franchise keeps the original authentic game mechanics that players know and love while introducing new dynamics, game modes, and a refined arsenal of weaponry. With a massive selection of character favorites and impressive next-gen graphics, Soul Calibur V will appease even the most die-hard fans of the arcade-fighting franchise. “We are thrilled to see Ezio enter the world of Soul Calibur, as we believe the values of both brands fit together” said Geoffroy Sardin, EMEA Chief Marketing and Sales Officer at Ubisoft. “We think that this partnership will bring a great new gameplay experience to both Soul Calibur and Assassin’s Creed fans”. Soul Calibur V is slated to release in January 31, 2012 for Xbox 360 and PS3. For more information please visit the game’s official website.